Every summer there is a raging debate on lump charcoal vs briquettes. Being the elementary component that you can’t grill without, it is no wonder grill lovers throughout the world defend their choice with so much zeal. Amateur cooks are becoming more opinionated and knowledgeable due to the proliferation of fancy charcoal grill equipment that has been flooding the market. Which is better for BBQ and grilling, charcoal or briquettes? First, let's have a look at some different brands of charcoal to get familiar with what's on the market. 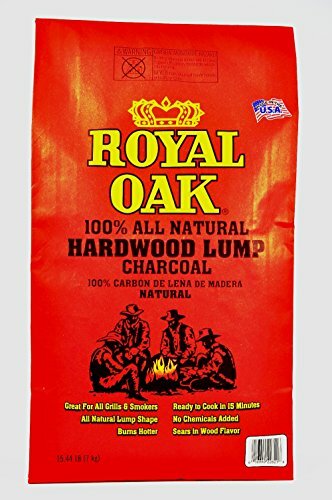 This natural hardwood lump charcoal by Royal Oak produces delicious flavor without a chemical aftertaste. As hardwood lump charcoal is made from hardwood with no fillers, this charcoal burns consistently and it burns hot. While briquettes are made of compressed wood and filler, hardwood lump charcoal contains only wood and thus imparts a terrific smoky flavor to whatever you cook over it. Natural hardwood lump charcoal imparts a great "woody" flavor to everything you grill. These lumps burn hot, produce little ash, and light quickly. They're a great addition to an open grill or a Big Green Egg. Lump charcoal sizing can be inconsistent. You'll need to monitor an open hardwood charcoal flame with more care, and be ready to move your grilled food to a cooler portion of the grill if a hot spot flares up. Fans of grilling who use a Big Green Egg will be very pleased with this lump charcoal. While briquettes can result in a lot of ash in the bottom of your Egg, natural lump charcoal burns much cleaner. 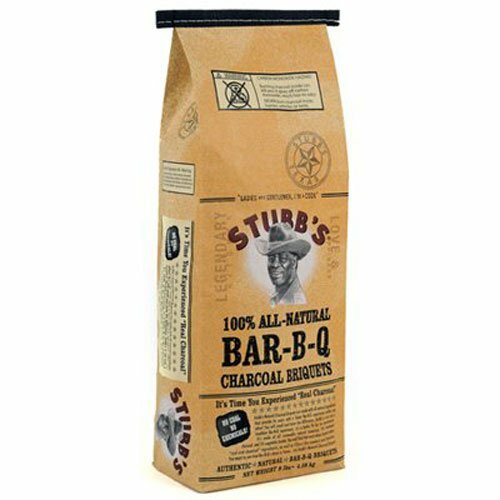 Stubb's charcoal briquettes offer grillers the best of both worlds. Not only do you get a uniformly sized and shaped briquette, but you get only wood products, compressed together with a vegetable binder. These briquettes produce very little smoke, burn hot and impart a terrific "woody" flavor to your barbecue. American-made Stubb's charcoal briquettes are made with hardwood products and a natural binder. They're easy to place of the grill and produce a very consistent burn with a wonderful aroma. Clean-up is easy because Stubb's briquettes produce very little ash. Stubb's apparently uses a Paraguayan source for their charcoal briquettes. The Paraguayan charcoal has little odor, burns poorly and releases a great deal of rather bland smoke. If you enjoy a natural hardwood flavor in your grilled meat, find the American made briquettes. 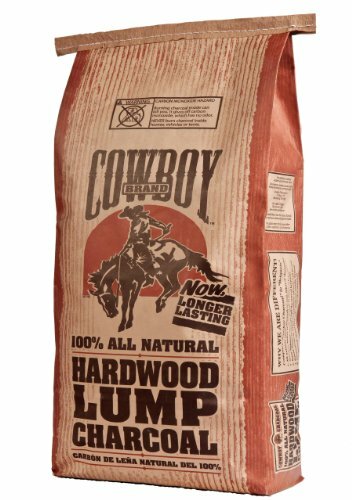 Cowboy lump charcoal is a natural hardwood charcoal with plenty of smoky flavor and a very hot fire. As with many natural lump charcoals, the sizing of the pieces offers a great deal of variety, so you'll need to tend your fire with care. Additionally, you may find extremely small pieces of wood and some dust in the bag. You'll get a great flavor of woodsmoke in whatever you cook over Cowboy charcoal. This product leaves little ash in your grill or egg thanks to the very clean burn of this lump charcoal. Because the sizing of the charcoal lumps is widely varied, you'll need to keep a close eye on your fire. This product can produce a lot of popping and hot spots. Keep an eye on the grill and be ready to relocate your food when a hot spot flares up. Jealous Devil is a great charcoal product for those who love to cook in the egg style grills. It offers plenty of large chunks for a hot burn with little popping. It lights quickly and produces a great flavor without being too woodsy. The chunks of wood in a bag of Jealous Devil charcoal can be quite large, so you get a hot, consistent burn. It's easy to get a consistent layout on your grill for great flavor and consistent heat. The packaging of Jealous Devil doesn't do a great job of capturing charcoal dust, so you may get dirty moving this product around. While all charcoal produces dust, Jealous Devil packaging seems to dump it on the users more than other charcoal products. 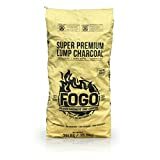 Fogo hardwood lump charcoal offers plenty of large chunks of hardwood charcoal in every bag. It lights easily with little popping and burns hot. The smoke odor is oak-y and very mild, allowing the natural flavor of your meat to shine through. Fogo's charcoal lumps are large enough to produce a very long burn. For fans of smokers, the very large pieces of charcoal produce an excellent, low-temperature burn. Large chunks of natural hardwood lump charcoal will produce a cooler fire and a longer burn. If you're cooking over an open grill or firepit, the large pieces offered by Fogo may be a challenge. As with any hardwood charcoal, you'll need to monitor the fire for hot spots and flare ups. What is lump charcoal? Regular charcoal also called lump charcoal is produced by burning wood devoid of oxygen. They are made from pieces of hardwood that have been reduced or charred to lumps. It’s called lump charcoal because it is still in its natural state. Regular charcoal doesn’t have any additives added, and that is why purists prefer it to briquettes. Regular charcoal lights faster and burn hotter as compared to briquettes and since it is all natural, it requires less managing when cooking. Lump charcoal produces very little ash after burning, making the grill less messy and, therefore, easier to clean. It responds faster to oxygen as it has no additives, therefore, making it faster for temperature adjustment. If you grill on a regular basis the cost can add up quickly. This is because charcoal burns quite quickly. Being all natural is a disadvantage in some way because that means that the charcoal isn’t pressed into briquettes. Retaining the natural shape means that they are usually small unusable remains of charcoal adding to the overall cost. Briquettes are produced using wood by-products. They comprise of crushed charcoal, combined with corn starch and other additives. Most brand manufacturers don’t expeditiously tell the buyers what fillers have been added to briquettes so you can never know what is in them. Some of the additives added, produce an odd smell when lit. They are inexpensive, reliable and readily obtainable. When lit, they produce a more consistent burn and burn longer as compared to regular charcoal. Therefore, they last for a long period and are easier to maintain a steady temperature for a prolonged period. Since they are pressed, they are the same size. Being consistent in size means less wastage as there will be no unusable pieces. They produce a lot of ash due to the fillers and additives added to them during production. This can make cleaning your grill more difficult. They often have a chemical smell that is sometimes irritating and could mess up your food. They are harder to light compared to regular charcoal. Although the taste of your BBQ that you get from pure charcoal is hard to beat, we would recommend the use of briquettes because they tend to be more readily available. Also, many charcoal brand manufacturers create briquettes using lighting fuel additives making them easier to light and have tried to ensure the chemical smell is minimized and lessen any potential ﻿﻿health risks associated with them. Did you enjoy this guide? Let us know in the comments with your preference, lump charcoal or briquettes? Earnings Disclaimer: When you buy products from some of the sites which we link to, KitchenSanity receives a commission. This doesn’t affect the price you pay and it helps support our site. Juicing To Lose Weight? Here’s How And Why! What Is A Pizza Peel? And How To Use One! Kitchensanity.com is a participant in the Amazon Services LLC Associates Program, an affiliate advertising program designed to provide a means for sites to earn advertising fees by advertising and linking to Amazon.com. Product prices and availability are accurate as of the date/time indicated and are subject to change. Any price and availability information displayed on Amazon.com at the time of purchase will apply to the purchase of this product. All prices on this site may change and those considered valid are displayed on Amazon.com. KitchenSanity tries its best to keep its information accurate and current. The information displayed is for information or education purposes only. This information is not a substitute for professional advice (medical, health, legal, etc…). You are 100% responsible for your actions and should seek professional advice before taking any action on any information or interpreted information. Individuals pictured are models and are used for illustrative purposes only. Additionally, Kitchensanity.com participates in various affiliate programs, and we sometimes get a commission through purchases made through our links.